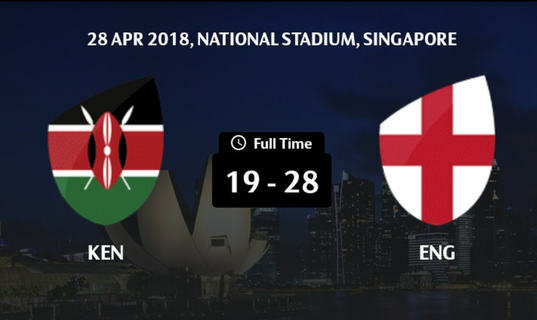 Shujaa began their Singapore Sevens campaign on the wrong footing after going down to England 7s in their first Pool B match at the National Stadium on Saturday morning. Collins Injera struck for Kenya in the first minute for a 5-0 lead but England replied through Dan Norton's brace that gave them a 14-5 half time lead. The English men got two more tries in the second half to set up a mountain for Kenya 7s to climb. Willy Ambaka reduced the deficit with a try well converted by Edin Agero. Nick Oyoo also found space to hit another try but it was a little too late as England went on to win 28-19. Shujaa's next pool match is against France 7s at 11:18am before winding up group matches against USA at 2:44pm Kenyan time.